Most of us have had one – a sudden involuntary contraction of a muscle or group of muscles which really really hurts. They are different from a muscle twitch which is an uncontrolled fine movement of a small segment of a larger muscle that can be seen under the skin. Spasms can affect large parts of a muscle group, the whole muscle, or even adjacent muscles. They can occur suddenly, usually resolve quickly, and are often painful. Spasms cause visible muscle twitching whereas a cramp is more of a prolonged and uncomfortable contraction. A muscle in spasm will feel tight and tender to the touch as it remains in spasm to protect the site from further injury. Although it is usually accompanied by pain, quite often the dog will live without showing outward signs so may well be missed. But when they are severe, a bulging muscle may be seen or felt underneath the skin at the site of spasm. If we get such a pain, we tend to feel the need to stretch the muscle involved, thus relieving the spasm and resolving the episode. But for a dog, this new pain can be quite traumatic and disorientating. Muscle spasms usually heal with time in a couple of days or weeks since the muscles retain their good blood supply to bring the necessary nutrients and proteins for healing to take place. But if they recur the affected muscles may start to weaken as dog may avoid using them which may, in turn, lead to muscular atrophy and subsequent weakening with time. Massage is a perfect therapy for these issues to try and prevent them or, at least, reduce their severity. Massage can also be used preventatively by warming up the muscles before any exercises and then gently helping them to cool down afterwards. Hopefully this will prevent the vicious pain-soreness-pain cycle. Now meet Millie. 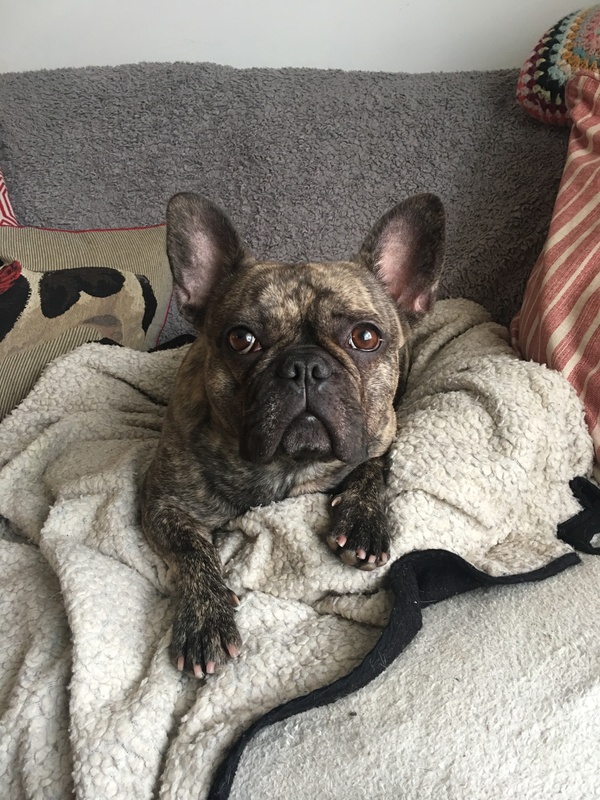 Millie is a 3 year old French Bulldog who has now had three episodes of spasm in her neck. These have been very severe which causes her neck muscles to bulge out and almost vibrate leaving her exhausted and panting at the end with her neck scrunched up like a tortoise going into its shell. Her discomfort is also displayed by her getting up, then lying down, then getting up again as though she simply doesn’t know which position to get into to relieve her pain. On the worst occasion her Mum thought she was possibly having a seizure and took her to the emergency vets. They said it was unlikely to be an epileptic fit or seizure as Millie turned to her Mum when called so was quite aware of her surroundings. Millie’s vet suggested that her she has some massage and physical manipulation to attempt to ease her stiff neck and prevent any further bouts. Millie is a very happy bouncy girl who is also quite responsive to massage as I discovered. On the initial touch she stood still judging who I was and what I was about to do then gradually helped me with my assessment. We started on the massage mat but she guided me up to the sofa so she could settle straight into her bed afterwards. Her neck muscles were extremely tight both superficially and deeper. She loved the kneading and stretching techniques. Luckily, she likes her treats so we were able to devise and practice a series of 4 active exercises to extend and help rotate her neck. By the end of the session she looked noticeably longer especially at the neck which also appeared visibly less bulky. Hopefully with maintenance and preventative regular massage and exercises from her Mum, we can help ease Millie’s issues and she can remain with her head and neck held high. 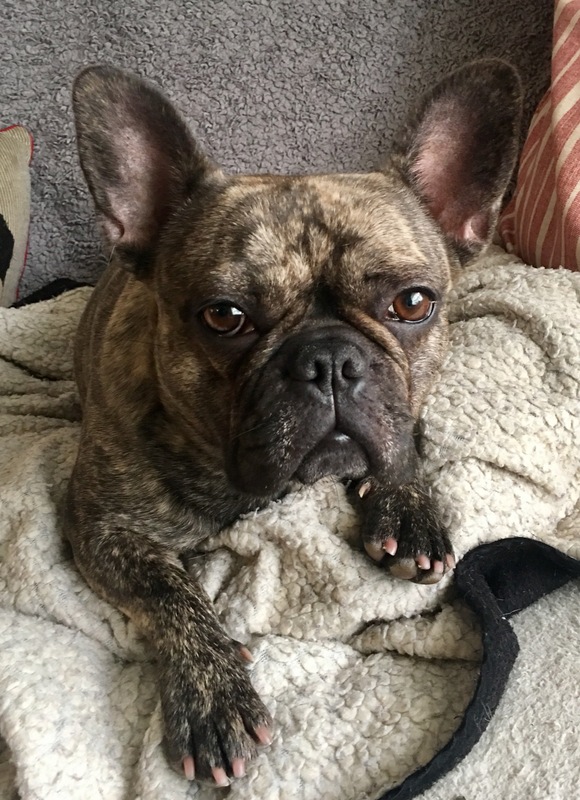 This entry was posted in acheypaw, achy paws, AchyPaw, Brighton Dog Massage, canine myotherapy, dog myotherapy, achypaw myotherapy, myotherapy, achy paws, Dog, Dog massage, injury prevention, muscle spasms, prevention, south coast dog massage, south coast myotherapy, Sussex, Therapeutic, therapeutic massage and tagged achy paws, achypaw, achypaw myotherapy, achypaws, Canine massage, canine myotherapy, Dog massage, east sussex, galen dog massage, injury prevention, massage, myotherapy, prevention, Saltdean, south coast, south coast dog massage, south coast myotherapy, therapeutic, therapeutic massage, www.achypaws.com. Bookmark the permalink.